Authored by David Rowlands, a leading heath informatician with 30 years’ experience in the health industry and published by HISA, the Certified Health Informatician Australasia, A Practitioner’s Guide to Health Informatics in Australia includes orientation for professionals such as clinicians or informaticians new to health informatics and updates for health informaticians wishing to maintain the currency of their knowledge irrespective of certification. The 2nd edition of the Practitioner’s Guide focuses explicitly on the needs of practitioners in the field of health informatics in Australia and is the result of a comprehensive review and update, with major changes in particular to Chapter 9, Health Administration and Health Services Research, resulting from significant changes to the organisation of Australia’s health system and the governance of digital health. 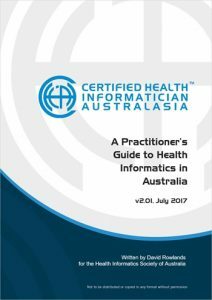 The guide is also a comprehensive body of knowledge for the competencies required for the Certified Health Informatician Australasia (CHIA) program. It is HISA’s definitive guide for CHIA candidates.